Rhyme and Punishment is a World of Warcraft guild situated on the Moonglade (EU) realm. The Black Temple was merely a setback. Again. Several places in Legion there are hints about the "coming darkness" "void" etc. Emerald Nightmare raid boss and the Suramar raid boss which opens void portals. Il'gynoth whispers: At last, the feeding hour! Il'gynoth whispers: At the hour of her third death, she ushers in our coming. Il'gynoth whispers: Come, little ones. Savor your fear as we feast upon it! Il'gynoth whispers: Every blow struck at our heart will be repaid a thousand fold! Il'gynoth whispers: Five keys to open our way. Five torches to light our path. ^This is likely referring to the 5 pillars of creation what we use to fight the Legion. So using them probably triggers something that helps the old gods. Il'gynoth whispers: Flesh is his gift. He is your true creator. Il'gynoth whispers: From the earth, he draws strength. Our earth. Our strength. Il'gynoth whispers: Her heart is a crater, and we have filled it. Il'gynoth whispers: Its surface blazes bright, masking shadows below. Il'gynoth whispers: Oblivion offers solace. Take the gift! Take it! Il'gynoth whispers: Out! Out! You are not yet worthy! Il'gynoth whispers: Rejoice! The end comes soon. Il'gynoth whispers: Release your grip on hope. Il'gynoth whispers: Still you fight? Still you refuse the gift? Il'gynoth whispers: The boy-king serves at the master's table. Three lies will he offer you. Il'gynoth whispers: The king of diamonds has been made a pawn. ^This likely refers to Magni. Perhaps the thing he thinks he is talking to is not the Azeroth titan world soul. Il'gynoth whispers: The lord of ravens will turn the key. Il'gynoth whispers: The pain of flesh is fleeting. True torment lasts forever. Il'gynoth whispers: To find him, drown yourself in the circle of stars. Il'gynoth whispers: Welcome death. Do not fight it. Il'gynoth whispers: You have failed those who needed you. Il'gynoth whispers: Your coming was foretold in the rings. The long circle is nearly complete. Then there is the patch 7.3 which opens Argus and we head there to conclude this expansion and to put end to the Legion once and for all. There are some quotes as well. 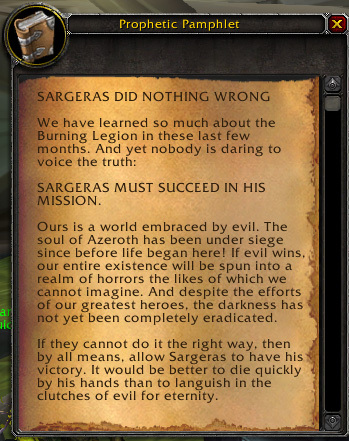 Namely Sargeras himself speaks about the coming darkness and the void. Also 7.3 there was interesting armor set added to the game called Kul Tiras which has map on it. Looks like intentional tease. Kul Tiras is Jaina's homeland so perhaps she went there and it likely plays some role in the next expansion. They just added to 7.3 PTR Doomsayers to Dalaran. Same guys who warned us about the Cataclysm. "Xal'atath Blade of the Black Empire: Long have we sought entry to this realm! To think we have a mortal to thank for giving us our foothold. Your service will be remembered!" My guess is that they will add Nagas as playable race since it fits with the old gods theme. They get the Pandarean treatment for getting both Horde and Alliance membership. Or perhaps Horde will get Ogres. Last edited by Juste on 30 Jul 2017, 12:42, edited 3 times in total. Stand your ground, child, keep your senses. The pain is fleeting, but victory is forever. Legion is kinda over, so changed the Forum title for ya! "Whomsoever takes up this blade shall wield power eternal. 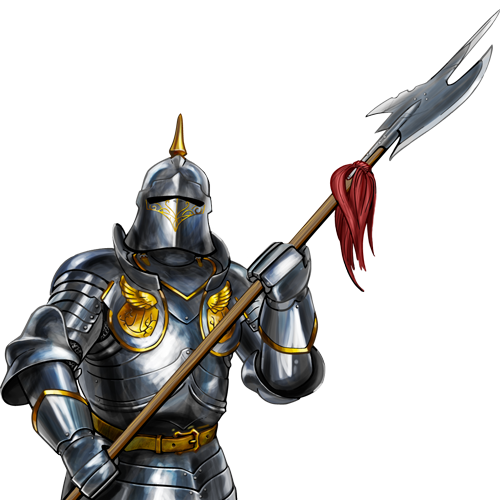 Just as the blade rends flesh, so must power scar the spirit." I would guess that they will make Kul Tiras like they did Suramar. Lorewise it's pretty big city taking up the whole island and it would be helluva cool to have Suramar type huge pirate city and Suramar imo was massive success in Legion. I certainly like the prospect of exploring more urban environments in zones. Suramar didn't speak to me much because I'm not a fan of elf lore, but the concept definitely had me interested. Juste on 30 Jul 2017 16:17 wrote: I would guess that they will make Kul Tiras like they did Suramar. "An illusion? What arrrre you hiding? Yarrrr!" What kind of sick individual burns a book full of perfectly good dark arts?! Now close at the end of Legion expansion at the Argus there seems to be heavy influence of Void and Ethereals (Who seem to have new models). In game cinematics tell more of the story of Sargeras and about Burning Legions relation to the Void. It seems that the whole story ties to the next expansion similar like WoD led to Legion expansion. They probably fully announce it at the Blizzcon. There was the whole treasure hunt thing (I forget its name right now), but it revolved pretty much completely around stuff/places that involve the old gods. I would put money on the next expansion being Old Gods-centric.